I replied "Smoking what? Cigarettes?" and she said "Yes, uhm and marijuana as well". I heard that 2 students from that class had been caught - an hour before- with a joint (not smoking it) in the classroom, so I related what had happened previously with her current question. It's kind of hard to provide an answer when I actually smoke weed and I do not define it as something "bad" per se. But, within the "teacher's role" we are supposed to attach to morality, values, etc. We are seen/considered almost like priests by parents and society sometimes and "we have to be an example" for their kids. I didn't want to give the typical and polarized speech that parents do when they tell their kids that drugs and alcohol are bad and that the only thing they have to do is getting good grades in order to make them feel proud and use it as a justification that they are doing what is defined/accepted as "right" for other parents and society. Smoking weed is not "bad". You are not going to be a "bad" person if you smoke it. You're not going to be a thief if you smoke it. You're not going to be less/more than others for smoking weed. But, what you have to make clear is your starting point towards smoking it. For instance, if you do it because all your friends do it and you want to be "accepted", that's not self-honesty. If you do it because you want to "run away" from your problems, that's not the solution, because you have to face yourself. If you want to do it once a week because you want to experience yourself with it and watch a movie or read something, it's up to you, but you have to be sure about the reason why you are doing it. It's not marijuana in itself which is "bad", it's all about your starting point and self-honesty. For instance, when my parents found out I smoked cigarettes, my dad hit me and he said that he was disappointed with me. I reacted like "What the hell! ", because he always smoked with mom and actually, I used to take their cigarettes, because they kept them in the kitchen. I thought "I bet they know I smoke, because I am smoking their cigarettes and they must have noticed they have less than before", but it wasn't like that. Parents sometimes tell their kids "if I am telling you off like this it's because I care about you and I love you", but they are reacting from fear. Fear of seeing their kids doing what they, other parents and society have defined as "wrong". Therefore, you have to be able to foster an effective communication with your parents, otherwise you are going to fall into an endless fight in which your parents will react telling you something that you don't want to hear and you will react with "You don't understand. You want me to be like you. I'm different", etc., etc. - Only creating friction -. 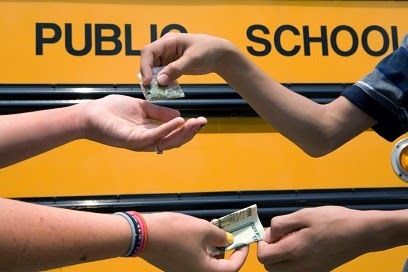 I concluded saying that if you bring marijuana to school you will compromise yourself. You can even be kicked out. And you want it or not, drugs are illegal and you can get problems with the police if they catch you carrying marijuana. When she asked me “do you do drugs?” I answered, “I did when I was at university, because I wanted to try new stuff like marijuana and alcohol, but that made me realize my limits. There were times in which I got terrible drunk, but I learned when I have to stop, in order to avoid feeling sick and causing problems to my friends, because when you get wasted, you trust your friends to take care of you, but that’s selfish/focused on self-interest. I didn’t mention that I still smoke weed, because she could have got me wrong and I didn’t want to compromise myself for possible comments or that she used my experience as a justification to keep doing the same (in case she does). I pictured her fighting with their parents about marijuana and saying "my teacher told me he does marijuana and that I can do it whenever I want, because it's not bad", causing their parents coming to school and complaining at me. That's also why I "lied". I forgive myself that I have allowed and accepted myself to activate negative reactions in the past when my family told me "You must do what I want, because you live in my house. Once you are older enough and you have your own house and family, you can do whatever you want!" I forgive myself that I have allowed and accepted myself to not see/realize and understand that my participation within the angry character inhibits me from finding a solution addressed by an effective communication. I forgive myself that I have allowed and accepted myself to think/believe/perceive that if I constantly do something, people are aware and that it's not necessary to mention anything. I forgive myself that I have allowed and accepted myself to create relationships with human beings in which I let everything to be understood as every single mind interprets/interpreted it. I forgive myself that I have allowed and accepted myself to think/believe/perceive that every single mind interpretation is going to be the same that I understand or how I experience myself. I forgive myself that I have allowed and accepted myself to not communicate with people effectively when having different points of view, in order to get understanding/comprehension. I forgive myself that I have allowed and accepted myself to not see/realize and understand that when I do not communicate effectively with other human beings, I am supporting anything but myself, because I am not considering the rest as me, as I would like to be explained. I forgive myself that I have allowed and accepted myself to experience an emotion of instability/doubt/fear when being asked for some advice. I forgive myself that I have allowed and accepted myself to ask for a feedback when I finished giving the advice, so as to get the approval, because after I mentioned my experience to that student, I said "That's the answer I have. Is that okay? What do you think?” and she said, "wow, you've now got me thinking about it", meaning that I encouraged her to analyze the situation from a different perspective. I forgive myself that I have allowed and accepted myself to think/believe/perceive that I am doing the "right" thing for giving some advice. I forgive myself that I have allowed and accepted myself to experience a positively charged feeling once I got the approval. I forgive myself that I have allowed and accepted myself to require the approval of others to be sure about what I do. I forgive myself that I have allowed and accepted myself to exist in the necessity of having the approval, instead of being stability within myself as self-expression. When and as I see myself not communicating effectively with human beings, meaning, I just assume they understand the same I do, I stop and breathe. I realize that when I repeat this patterns/behavior I am creating the possibility of friction once our ideas are different and we all assumed we were participating under the same (tacit) agreement. I forgive myself that I have allowed and accepted myself to participate/create tacit agreements instead of creating a clear and direct one from an effective communication. I commit myself to establish a clear and direct communication with other human beings in order to foster agreements in which we all work under the same principles. I commit myself to consider others as one and equal and to create communication and clarity as I like to receive, because when someone does not communicate well with me I tend to think/believe they are hiding the truth and I immediately activate judgments. I forgive myself that I have allowed and accepted myself to think/believe that when there's no clear understanding/communication it's because human beings are hiding the truth. I forgive myself that I have allowed and accepted myself to think/believe that the truth is when human beings have an effective communication without misunderstandings. I forgive myself that I have allowed and accepted myself to judge human beings that do not communicate effectively as if they were liars. When and as I see myself judging human beings that do not communicate effectively with me and I define them as liars, I stop and breathe. I realize that I am only judging instead of being the example of an effective communication. Therefore, I am judging myself, because I have separated the system existing within me but without as others. I commit myself to stop and breathe when I catch myself participating in judgments and defining human beings as liars because they do not communicate effectively.